The foramen ovale is a normal cardiac structure found in all newborns and can be best described as a "door" between the right and left atria. The foramen ovale is essential for proper fetal circulation, directing oxygenated, nutrient-rich blood from the placenta, preferentially to the developing fetal brain. During fetal life, the "door" is open, and blood passes from the right to left atrium. However, with separation from the placenta and with the first few breaths, the left atrium fills with blood returning from the lungs and closes the "door." During the first years of life, the foramen ovale seals shut and becomes a true wall that separates the right and left atria. However, in a significant proportion of people, the foramen ovale does not seal shut and remains a potential trapdoor between the 2 atria. A patent foramen ovale (PFO) is defined as a foramen ovale that does not seal. See the images below. 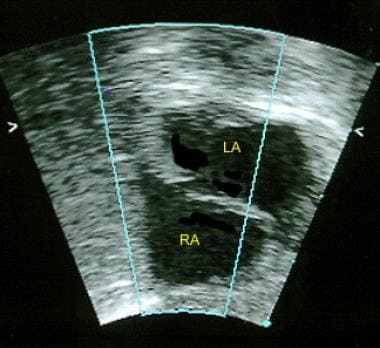 This 2-dimensional echocardiogram in an infant (subcostal long-axis view) shows a patent foramen ovale. Right atrium (RA) and left atrium (LA). 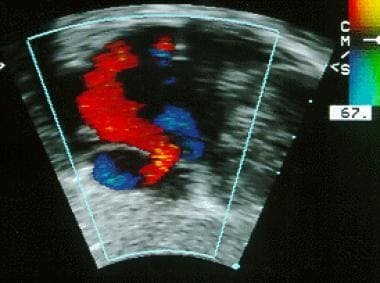 Color Doppler of the patent foramen ovale (PFO) seen in the previous image. A small amount of left-to-right flow is present. This left-to-right flow pattern is typical for PFO seen in newborn infants. Although it is a normal structure, a foramen ovale has several special circumstances under which it may be implicated in disease. Persistent left atrial enlargement associated with specific cardiac lesions, such as mitral valve stenosis, mitral valve regurgitation, patent ductus arteriosus, or ventricular septal defect, can render the foramen ovale "incompetent." Atrial left-to-right shunting can continue as a result. Right-to-left shunting can occur through a patent foramen ovale, especially in conditions associated with elevated right atrial pressure such as tricuspid valve stenosis or right ventricular hypoplasia with decreased right ventricle compliance. Patients with persistent or transient elevation of right atrial pressure can experience a paradoxical embolus through a patent foramen ovale. Some congenital heart lesions depend on the foramen ovale for obligatory left-to-right (mitral atresia) or right-to-left (tricuspid atresia, total anomalous pulmonary venous return) shunting to maintain adequate cardiac output. Several echocardiography and postmortem studies indicate that the foramen remains competent in 30% of patients with otherwise normal cardiac anatomy. Hagen PT, Scholz DG, Edwards WD. Incidence and size of patent foramen ovale during the first 10 decades of life: an autopsy study of 965 normal hearts. Mayo Clin Proc. 1984 Jan. 59(1):17-20. [Medline]. Kutty S, Sengupta PP, Khandheria BK. Patent foramen ovale: the known and the to be known. J Am Coll Cardiol. 2012 May 8. 59(19):1665-71. [Medline]. Menon SC, Grove A, McFadden M, et al. Clinical practice, resource utilization, and outcomes of device closure of patent foramen ovale in pediatrics. Pediatr Neurol. 2014 Mar. 50(3):213-7. [Medline]. Agnetti A, Carano N, Sani E, et al. Cryptogenic stroke in children: possible role of patent foramen ovale. Neuropediatrics. 2006 Feb. 37(1):53-6. [Medline]. Bartz PJ, Cetta F, Cabalka AK, et al. Paradoxical emboli in children and young adults: role of atrial septal defect and patent foramen ovale device closure. Mayo Clin Proc. 2006 May. 81(5):615-8. [Medline]. Filippi L, Palermo L, Pezzati M, et al. Paradoxical embolism in a preterm infant. Dev Med Child Neurol. 2004 Oct. 46(10):713-6. [Medline]. Petty GW, Khandheria BK, Meissner I, et al. Population-based study of the relationship between patent foramen ovale and cerebrovascular ischemic events. Mayo Clin Proc. 2006 May. 81(5):602-8. [Medline]. Reisman M, Christofferson RD, Jesurum J, et al. Migraine headache relief after transcatheter closure of patent foramen ovale. J Am Coll Cardiol. 2005 Feb 15. 45(4):493-5. [Medline]. Kruit MC, van Buchem MA, Hofman PA, Bakkers JT, Terwindt GM, Ferrari MD. Migraine as a risk factor for subclinical brain lesions. JAMA. 2004 Jan 28. 291(4):427-34. [Medline]. Post MC, Budts W. The relationship between migraine and right-to-left shunt: Fact or fiction?. Chest. 2006 Sep. 130(3):896-901. [Medline]. Kizer JR, Silvestry FE, Kimmel SE, Kasner SE, Wiegers SE, Erwin MB. Racial differences in the prevalence of cardiac sources of embolism in subjects with unexplained stroke or transient ischemic attack evaluated by transesophageal echocardiography. Am J Cardiol. 2002 Aug 15. 90(4):395-400. [Medline]. Gupta V, Yesilbursa D, Huang WY, Aggarwal K, Gupta V, Gomez C. Patent foramen ovale in a large population of ischemic stroke patients: diagnosis, age distribution, gender, and race. Echocardiography. 2008 Feb. 25(2):217-27. [Medline]. Fisher DC, Fisher EA, Budd JH, et al. The incidence of patent foramen ovale in 1,000 consecutive patients. A contrast transesophageal echocardiography study. Chest. 1995 Jun. 107(6):1504-9. [Medline]. Schwedt TJ, Demaerschalk BM, Dodick DW. Patent foramen ovale and migraine: a quantitative systematic review. Cephalalgia. 2008 May. 28(5):531-40. [Medline]. McCandless RT, Arrington CB, Nielsen DC, Bale JF Jr, Minich LL. Patent foramen ovale in children with migraine headaches. J Pediatr. 2011 Aug. 159(2):243-7.e1. [Medline]. Toffart AC, Bouvaist H, Feral V, Blin D, Pison C. Hypoxemia-orthodeoxia related to patent foramen ovale without pulmonary hypertension. Heart Lung. 2008 Sep-Oct. 37(5):385-9. [Medline]. Mas JL, Arquizan C, Lamy C, Zuber M, Cabanes L, Derumeaux G. Recurrent cerebrovascular events associated with patent foramen ovale, atrial septal aneurysm, or both. N Engl J Med. 2001 Dec 13. 345(24):1740-6. [Medline]. Telman G, Yalonetsky S, Kouperberg E, Sprecher E, Lorber A, Yarnitsky D. Size of PFO and amount of microembolic signals in patients with ischaemic stroke or TIA. Eur J Neurol. 2008 Sep. 15(9):969-72. [Medline]. Homma S, Sacco RL, Di Tullio MR, Sciacca RR, Mohr JP. Effect of medical treatment in stroke patients with patent foramen ovale: patent foramen ovale in Cryptogenic Stroke Study. Circulation. 2002 Jun 4. 105(22):2625-31. [Medline]. Torti SR, Billinger M, Schwerzmann M, et al. Risk of decompression illness among 230 divers in relation to the presence and size of patent foramen ovale. Eur Heart J. 2004 Jun. 25(12):1014-20. [Medline]. [Full Text]. Mammoto T, Hayashi Y, Ohnishi Y, Kuro M. Incidence of venous and paradoxical air embolism in neurosurgical patients in the sitting position: detection by transesophageal echocardiography. Acta Anaesthesiol Scand. 1998 Jul. 42(6):643-7. [Medline]. von Bardeleben RS, Richter C, Otto J, Himmrich L, et al. Long term follow up after percutaneous closure of PFO in 357 patients with paradoxical embolism: Difference in occlusion systems and influence of atrial septum aneurysm. Int J Cardiol. 2008 Aug 18. [Medline]. Majunke N, Baranowski A, Zimmermann W, et al. A suture not always the ideal solution: Problems encountered in developing a suture-based PFO closure technique. Catheter Cardiovasc Interv. 2008 Oct 27. 73(3):376-382. [Medline]. Sievert H, Ruygrok P, Salkeld M, et al. Transcatheter closure of patent foramen ovale with radiofrequency: Acute and intermediate term results in 144 patients. Catheter Cardiovasc Interv. 2008 Oct 27. 73(3):368-373. [Medline]. Messe SR, Silverman IE, Kizer JR, Homma S, Zahn C, Gronseth G. Practice parameter: recurrent stroke with patent foramen ovale and atrial septal aneurysm: report of the Quality Standards Subcommittee of the American Academy of Neurology. Neurology. 2004 Apr 13. 62(7):1042-50. [Medline]. Arquizan C, Coste J, Touboul PJ, Mas JL. Is patent foramen ovale a family trait? A transcranial Doppler sonographic study. Stroke. 2001 Jul. 32(7):1563-6. [Medline]. [Full Text]. Berger F, Ewert P, Bjornstad PG, et al. Transcatheter closure as standard treatment for interatrial defects: experience in 200 patients treated with the Amplatzer Septal Occluder. Cardiol Young. 1999. 9:468-473. [Medline]. Chatterjee T, Petzsch M, Ince H, et al. Interventional closure with Amplatzer PFO occluder of patent foramen ovale in patients with paradoxical cerebral embolism. J Interv Cardiol. 2005 Jun. 18(3):173-9. [Medline]. Dearani JA, Ugurlu BS, Danielson GK, et al. Surgical patent foramen ovale closure for prevention of paradoxical embolism-related cerebrovascular ischemic events. Circulation. 1999 Nov 9. 100(19 Suppl):II171-5. [Medline]. Duke DA, Lynch JJ, Harner SG, et al. Venous air embolism in sitting and supine patients undergoing vestibular schwannoma resection. Neurosurgery. 1998 Jun. 42(6):1282-6; discussion 1286-7. [Medline]. Fuchs G, Schwarz G, Stein J, et al. Doppler color-flow imaging: screening of a patent foramen ovale in children scheduled for neurosurgery in the sitting position. J Neurosurg Anesthesiol. 1998 Jan. 10(1):5-9. [Medline]. Guntheroth WG, Schwaegler R, Trent E. Comparative roles of the atrial septal aneurysm versus patent foramen ovale in systemic embolization with inferences from neonatal studies. Am J Cardiol. 2004 Nov 15. 94(10):1341-3. [Medline]. Hansen LK, Oxhoj H. High prevalence of interatrial communications during the first three months of life. Pediatr Cardiol. 1997 Mar-Apr. 18(2):83-5. [Medline]. Hanzel GS. Complications of patent foramen ovale and atrial septal defect closure devices. J Interv Cardiol. 2006 Apr. 19(2):160-2. [Medline]. Kizer JR, Silvestry FE, Kimmel SE, et al. Racial differences in the prevalence of cardiac sources of embolism in subjects with unexplained stroke or transient ischemic attack evaluated by transesophageal echocardiography. Am J Cardiol. 2002 Aug 15. 90(4):395-400. [Medline]. Maisel WH, Laskey WK. Patent foramen ovale closure devices: moving beyond equipoise. JAMA. 2005 Jul 20. 294(3):366-9. [Medline]. Meissner I, Khandheria BK, Heit JA, et al. Patent foramen ovale: innocent or guilty? Evidence from a prospective population-based study. J Am Coll Cardiol. 2006 Jan 17. 47(2):440-5. [Medline]. Rao PS. Transcatheter management of platypnea-orthodeoxia syndrome. J Invasive Cardiol. 2004 Oct. 16(10):583-4. [Medline]. Schuchlenz HW, Weihs W, Berghold A, et al. Secondary prevention after cryptogenic cerebrovascular events in patients with patent foramen ovale. Int J Cardiol. 2005 May 11. 101(1):77-82. [Medline]. Wilmshurst PT, Pearson MJ, Nightingale S, et al. Inheritance of persistent foramen ovale and atrial septal defects and the relation to familial migraine with aura. Heart. 2004 Nov. 90(11):1315-20. [Medline]. [Full Text]. Wyland J, Krulak D. U.S. navy diver/aviator/skydiver with AGE from a previously unknown PFO. Undersea Hyperb Med. 2005 Mar-Apr. 32(2):129-33. [Medline]. Transesophageal echocardiogram showing the atrial septum. The "flap" of the septum primum is seen. The diagnosis of patent foramen ovale (PFO) cannot be made until right-to-left bubble contrast is demonstrated. LA = Left atrium; RA = Right atrium. Bubble-contrast injection during Valsalva maneuver. The "flap" of the foramen ovale is opened and bubbles are seen crossing from the right atrium to the left atrium (arrow). Transesophageal echocardiogram revealing a 25-mm Amplatzer patent foramen ovale (PFO) occluder in place across the PFO shown in the previous 2 images. Transesophageal echocardiogram of a patent foramen ovale (PFO) closed with 25-mm Amplatzer PFO occluder. Bubble-contrast study with Valsalva post-device placement shows no residual right-to-left bubble passage. Transcranial Doppler (TCD) study with bubble-contrast study. A Doppler probe is used to interrogate the right middle cerebral artery. Frame 1 shows normal findings. Note the absence of bubble artifact of Doppler signal in the middle cerebral artery. Frame 2 shows strongly positive (5/5) bubble transit seen in a patient with a patent foramen ovale (PFO) during Valsalva maneuver. TCD is a useful screening tool for PFO because of its ease-of-use and ability to easily quantify the amount of potential right-to-left shunt. One of the pitfalls is the inability to differentiate between other sources of right-to-left shunt, such as pulmonary arteriovenous malformation and a PFO. Transesophageal echocardiogram of bubble contrast study showing right-to-left passage of bubble-contrast with a Valsalva maneuver. RA = Right atrium. LA = Left atrium. Arrow shows bubble passage to LA. Transesophageal echocardiogram showing a 10-mm Amplatzer Septal Occluder in place across a patent foramen ovale.